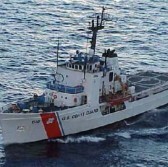 The U.S. Coast Guard plans to acquire small unmanned aircraft systems that can provide intelligence, surveillance and reconnaissance support for the Legend-class national security cutters, C4ISRNET reported Wednesday. USCG issued a draft request for proposals for small UAS in March and the service branch plans to release a full RFP later this year. A potential fiscal year 2018 award could also bring search-and-rescue updates to nine Legend-class ships, the report stated. USCG seeks UAS that feature electro-optical and infrared systems and can operate for up to 12 hours. “There aren’t a lot of spare hands to launch and recover aircraft, so we need something that requires minimal manning and has a high degree of autonomy,” said Dan Broadhurst, head of the UAS division in USCG’s aviation capabilities office. Broadhurst added the service branch wants to eventually deploy a drone fleet that can detect other aircraft and avoid collisions autonomously. Jeffrey Bishop, USCG program manager for small UAS, noted the vendor must also provide UAS operations support since the Coast Guard lacks personnel with technical skills to fly unmanned aircraft, according to the report.